Don’t let that fancy name scare you away. 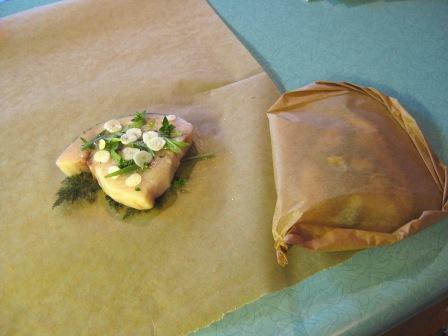 Cooking “en papillote,” or in a paper pouch, is one of the easiest and most delicious ways to cook fish. You’re essentially creating simple little steam ovens made of paper: the moisture stays fully enclosed in the packet and all the flavor of both the fish and the added seasonings is trapped inside. Otherwise the technique’s as convenient as baking, you just pop the packets in the oven and let the magic happen. Which is exactly what I did last night for dinner. It may look like an intimidating prospect, but wrapping up in paper isn’t tough. I first learned this curved version of folding the paper, but you can just as well fold in the sides in even straight lines. Though the curved method does seem to hold itself together better. I always start on the right side and fold over at shifting angles to work around toward the other side; then when done, twist the last bit of paper to secure it, creating a little tail. If you need a couple strategically placed staples to hold things together the first couple of tries, no worries. You’ll get the hang of it! You can even do this with foil instead of paper; a bit less aesthetically pleasing but it holds those folds like a dream. The technique works best for lean, quick-cooking foods like fish and boneless, skinless chicken breasts. I haven’t ventured very far outside that spectrum. When looking at the meat or seafood case, ask yourself “would I want [fill in the blank] steamed?” and it might help guide your choices. I like to keep the seasonings simple when I go the papillote route. In my Wild Mushrooms cookbook, I chose to showcase the beguiling matsutake mushroom in a papillote recipe with chicken breast. The thinly sliced mushroom covers the chicken breast, then a little splash of sake and soy is added before wrapping up to bake. The simple, earthly flavors coalesced beautifully. But back to last night. The basic combo I chose then was swordfish, herbs and garlic. Thanks to our early spring weather here in Seattle, I was able to pluck tender tarragon, bronze fennel and thyme from the garden. Then I thinly sliced a big fat clove of garlic on my handy little mandoline slicer . I laid the frond of fennel down on the paper first. 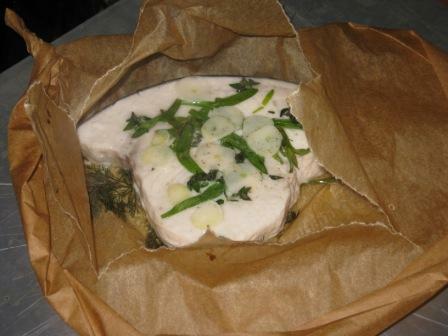 It’s good to place the food just below the center point of a large piece of the parchment paper. (Don’t scrimp on the paper, it should be about 2 feet long; you’ll thank me later.) I like setting the fish on a little bed of something just to add a bit more flavor from the bottom up. It could be thinly sliced yellow or red onion, leeks, green onions, other herbs. But just a thin layer; this is a quick cooking method and you don’t want a volume of leeks to impede the packet being cooked evenly in 8 to 10 minutes. 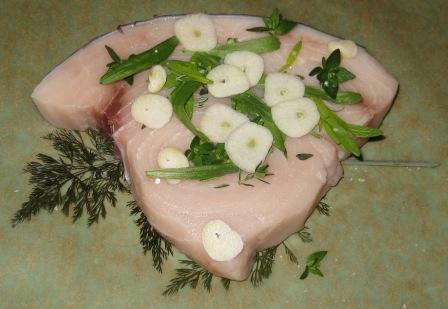 With the swordfish steak sitting on its bed of fennel, I topped the fish with whole leaves of tarragon and plucked leaves from the thyme sprigs. A pinch of salt and pepper. A tiny splash (maybe 1 teaspoon) of dry vermouth. Then on with the folding! I made these a couple of hours in advance, set them on the baking sheeting and popped it in the fridge until we were ready to eat. A nice do-ahead option, though I wouldn’t prep it too much in advance or the liquid risks softening the paper too much, impeding the effectiveness of the mini-steam-oven effect. I baked these packets for about 9 minutes at 400°F. One thing about papillote is that the visual-cue-of-doneness factor is eliminated. So you have to gain some comfort with cooking to doneness based on time, adjusting for the thickness and density of the food you’re cooking. Those chicken breasts, for example, I cooked for about 18 minutes. These fish steaks were about 1 inch thick. I’d say in general a minimum time might be 7 to 8 minutes for a thinner piece of fish, up to 20 max for chicken, but I’d recommend staying within that range. One of the benefits of papillote cooking is that when you first tear open the packet there’s a lovely waft of aromatic steam that rises to entice you. It’s fun to transfer the whole packets to the dinner plates and allow your guests to enjoy that for themselves, warning them of course that the steam’s hot, so not TOO close! Just a simple tear in the top of the packet reveals the juicy, flavorful treat inside. A little drama to go with dinner. And it was, if I do say so myself, pretty scrumptious.